New books bring big smiles to VU students. On the last day of homework assistance for 2016, VU students received a holiday gift bag. By far the favorite item was the personally selected book that each child found inside! 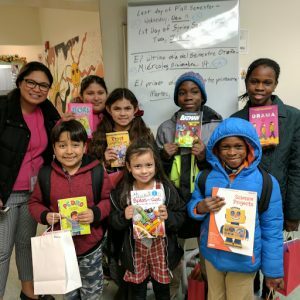 Thanks to a fundraising effort by volunteer Alicia Bowen (far left in photo), VU president Andrea Ciecierski was able to select a individualized book for each of our 30 students. As you can see from the smiles, a book to own is special indeed. Upon finding her book, one of our students expressed her surprise, “This is my favorite! How did you know?” Well, we have our ways. On behalf of the board at Vecinos Unidos, Happy Holidays and Happy New Year to all. And a special thank you to all of our wonderful dedicated volunteers. We are looking forward with excitement to all that 2017 will bring!